Working with the NaPoWriMo prompt today to write a poem that engages with another art form. I have been watching my nine year old daughter learning and loving to play the drums, so that was the first art form that came to my sentimental, parental mind. to be a drummer, you only need a body. of my own heart, close to you. Primal instruments — the drum, the heart. Soundtrack to battle, to rally, to rise. I love looking at vintage postcards, so I appreciated the NaPoWriMo.net prompt for Day 28 asking for a postcard poem. There is sunshine and Maggie keeps telling me how warm the sand is beneath her toes. Like heaven, she says, and the stillness of the waves today — the sweet perk of Trixabelle’s ears when she hears children playing up higher on the beach — do suggest a certain beatitude. But there is another feeling here, one more difficult to capture in short words. Something unexpected and heavy, like reaching for an empty shoebox and discovering its filled with lead beads. Anna and Jane say I am being melancholy, spoiling things, since it’s been so long since all of us were together, but perhaps that’s what’s wrong. Time is exposed here, like the husk of a dead crab, caught bobbing at the edge of the shore. Bouncing, bouncing and never escaping the jostling water. 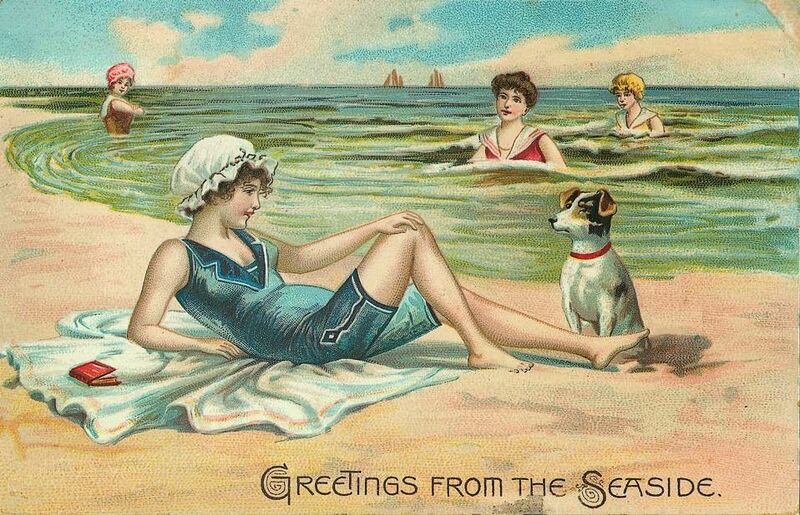 If I could, I would send you that sun bleached shell, instead of this verbose postcard. Then you would understand what kind of woman agrees, even though all she wants is to be hers and hers alone. The NaPoWriMo.net prompt today called for a “rebellion” poem. At Poetic Asides, the prompt suggested taking a line from one of our poems written earlier this month, and using it as a first line for a new poem. My first line came from my Day 9 poem. Let’s burn this place to the ground. I don’t think of myself as destructive. It’s the fresh start that hooks me. It’s all a dumpster fire, but what comes after? set fire to her family home. Accident. No injuries. Black hole on a sunny street. I always hoped she did it on purpose. A little truth she kept warm in her chest. A plan, all along, to call out the phoenix. Today’s NaPoWriMo.net prompt asked for “poems in which mysterious and magical things occur. A spell, for example.” I liked that example, and mashed it with the Poetic Asides prompt asking for a “family” poem. This one was strange and mysterious for me, as I so rarely attempt to write anything with rhyme. we grow, share and shed. of a full moon, red. lines etched on their skin. Today’s prompt asked for a “love” or “anti-love” poem, or a mashup. It’s been a hard year to love. With every headline, a thickening of the skin, a shell forming around a once hopeful heart. So, necessity has invented new passions. Balms, for myself and my kids. Dance parties to pop songs I used to hate. More time reading — escaping into fairy lands, fantastic realms, places where the heroines discover the light, no matter how dark the journey. I look at old photos with new eyes. My cousin, gone now, but beaming then, so near the end. The radiant smile everyone mentions in their tributes. My baby niece smirking in her sleep, not just contentment, but happiness that she is here. Existence itself a marvel. A photo of my daughters on my sister’s lap, summer sun making them all squint. Determination engraved on their faces, like a monument to great change ahead. The mothers, grandmothers, daughters, sisters, aunts, cousins and friends, and every woman who has laughed, loved, cried, bled, raged, hoped and dreamed. The poets, the novelists, the playwrights, the storytellers, the comedians, the journalists, and any woman who wields the power of words. The singers, the musicians, the painters, the sculptors, the dancers, and any woman who knows creativity can and does inspire change. The scientists, the farmers, the nurses, the doctors, the chefs, the entrepreneurs, the engineers, the teachers, the caregivers, the drivers, the business leaders, the billions of women who work every day to build their families, their communities and their world. What a gift to know I could never begin to list all the women who’ve inspired me, moved me, entertained me, cared for me, and taught me. The list is too long. The list keeps growing. You are on this list. Today, and every day, I appreciate having you in my life. Today is just a day, but this year — this time in our lives when all that women have done and built seems so fragile, so in danger of cracking — it is also a rallying cry. To stay strong, stay hopeful, stay compassionate, stay bold. Be brave, and weird, and beautiful, and open, and crazy, and hilarious, and kind, and supportive. Be everything you already are and everything you can be. We need each other. The world needs us.